I think it's about time that I share this story with you. But before giving you a tour of the Hummingbird house, let's travel back in time a little bit. We stepped on Canadian land at the end of April 2017, with no particular plans in mind, apart from travelling and discover the country. After some (too much) time in Montreal, we bought a van, and travelled for 4 months around the Eastern part of the second biggest country in the world. Four provinces (Quebec, New Brunswick, Prince Edward Island, Nova Scotia) and a few thousand kilometers later, we decided to settle down for a few months for work (unfortunately, travelling does cost money, and as much as I'd love to be travelling full time, we have been working this way for the last few years, travelling for a while, then settling down to work and save before hitting the road again). What was supposed to be just a short volunteering experience ended up being a quite long term home+work situation. 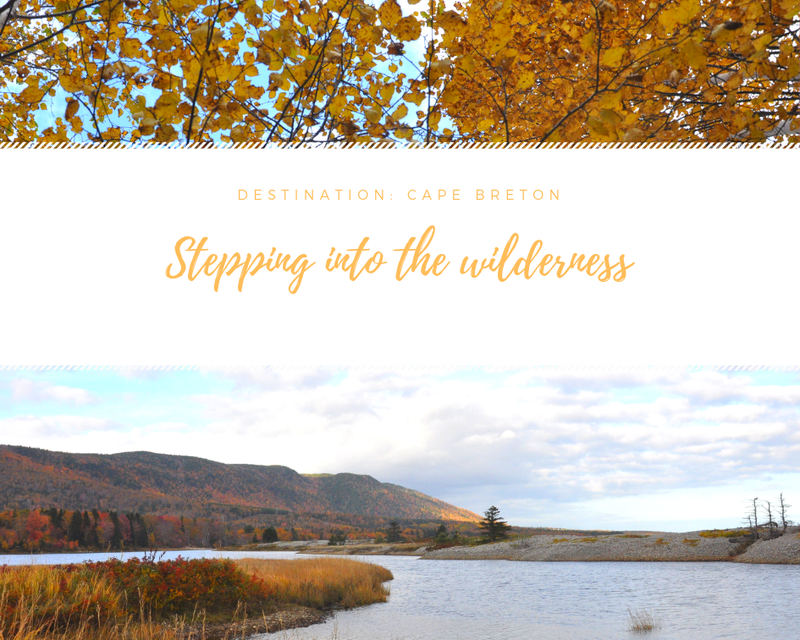 We arrived at Cabot Shores Wilderness Resort, on the beautiful Cape Breton Island, in Nova Scotia, and ended up staying for more than a year. 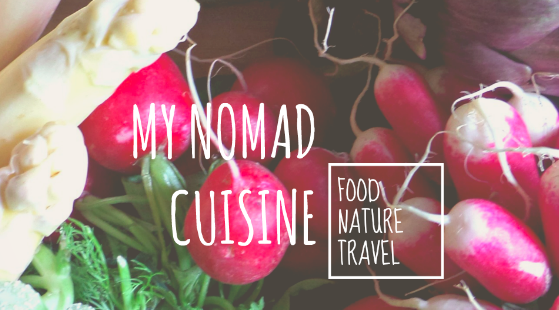 This little nature gem offers visitors a down-to-earth peaceful and unique experience with yurts and geodesic domes, a bistro and an array of outdoor activities. It has been the perfect home for us, and we got to experience wilderness at its best (and also its worst... hello Canadian Winter!). We worked full time in the resort, and also lived on site. And what a place to call home : nestled between the Atlantic Ocean and the Cape Breton Highlands mountains, we were literally lost in the middle of nowhere, with coyotes, bald eagles and moose for neighbours. Then, in the middle of the forest, D saw this little cabin. Just a simple cabin, with 4 plywood walls and a roof, a door and one single window. Nothing fancy, yet so much potential. And the location, man, the location. Secluded, (yet still on the property and close enough to the rest of the facilities), but surrounded by a wild forest of maple, spruce and birch trees. It didn't take him long to figure out a plan for the house, and by the end of the cold Winter, we started working on the house. As I said, the structure (built a few years earlier by another staff member) of the house was very basic : 4 plywood walls, and a roof, a door and one window. This base allowed us to be creative around it, and to take into whatever direction we decided. For budget and environmental reasons, our idea and goal was to renovate this cabin in the woods using mostly recycled and salvaged materials. Which we managed quite well I think, as the only money that was spent was less than $200 on electrical equipment, for the wiring and solar panel installation. All the rest of the materials were found on site (leftover building materials of other construction projects on the resort, scrap pieces of wood, natural materials, random materials found here and there...), and our main material : pallets. We had to do quite a few trips to town, driving at the back of stores, to find some beautiful pallets to use for the interior walls of the cabin. Working with recycled materials is fun, and really brings on your creativity. It is a choice we made deliberately, as we do believe in lowering our impact on the world, and seeing the amount of stuff that gets thrown away all around the world, but that is still usable, we thought we had to make this construction project happen in accordance with our beliefs. Why buy new materials when something already exists somewhere? Here's one of the main principles of the zero-waste lifestyle : someone's trash is someone else's treasure. That's exactly what happened for us there : going a around, looking at these odd pieces of wood, used pallets, your mind just go crazy with ideas on how to give this piece of "trash" a new life, a new purpose. There is a downside though to working with recycled materials, and especially salvaged pallets : each piece is different, size, thickness, colour, texture, strength... therefore each piece of wood has to be worked with individually, which makes the work sooo much slower than if you were using brand new uniform wood. But hey, seems like time is the price to pay to get something that look like this. For the pallet walls, we had collected many pallets made of different wood, soft or hard, painted, varnished or not, and decided to use this diversity in our design : the whole cabin is covered with a mixed pattern of colours and textures. We have left some pallets just as they were, some others were simply sanded lightly, and others were sanded and painted or stained over, with leftover buckets of paint and stain that we found. Once the walls were insulated, we laid each "line" of the wall on the floor, arranging the boards in a certain way, then cut individually to size before hammering them up on the structure. 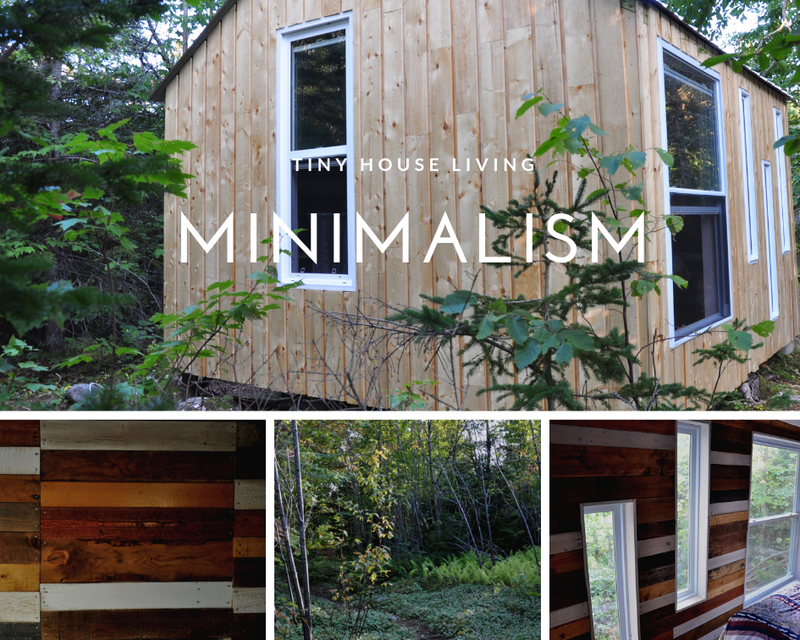 Furnishing the tiny house : keep it simple and practical. 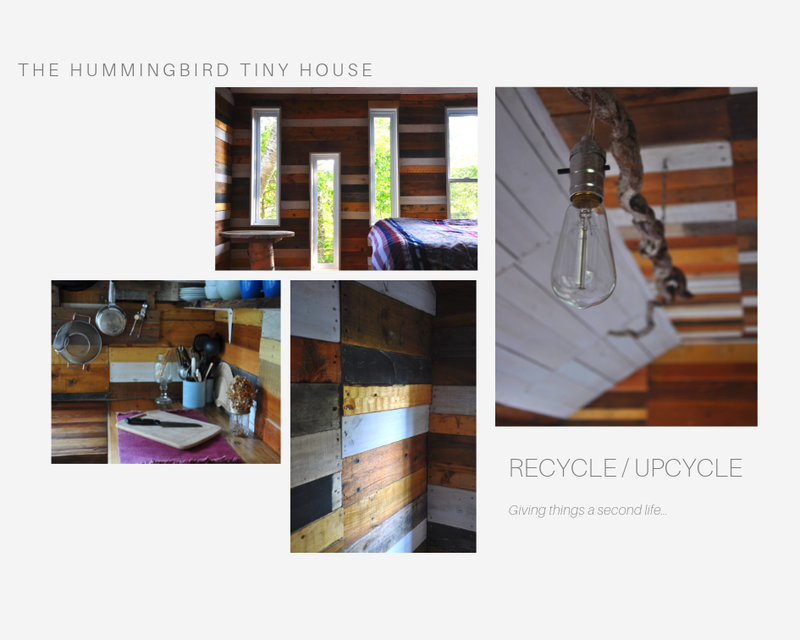 The Hummingbird house is a -very- tiny house. About 9 m². We had lived in small spaces before (sweet memories for our campervans) and knew what was important in designing the interior of the tiny house. Simple : stick to the minimum furniture, a bed, some storage, table and chairs. Minimalism is the key to a quality daily life in a small (or big) space. Stick to what you really are gonna use on a daily basis. The rest is considered non essential. Light and spacious : our choice of using recycled material, and especially pallets, brings a very unique, funky touch to the space. But in a certain way, it also makes it "crowded" for the eye, so we thought it was important to keep a maximum of "empty space", to give the idea of a living area that's not too full of stuff everywhere. - Most of the storage is located in the "mezzanine"space, under the roof. A shelf that covers the whole length of the tiny house on both sides, with an empty space in the middle to reach easily our stuff, but also bring in some light and space. This is where we stored most of our clothes, shoes, books, toiletries, etc. - The futton. We looked at many styles of DIY futton and beds online, thinking what would be the best system for our house. After a lot of thought, D came up with this amazing and very practical queen bed, that folds into a very comfy couch, the best seat in the house, facing the large window overlooking the forest, There's also a little table at the back of the couch when it's up, which we used either as an extra countertop when cooking, or just as our table to eat. - The kitchen. Yet again, we kept it simple. A nice countertop to cook on, and below it a few shelves to store all of our dry food. A couple of higher shelves for plates and cups, and an old small pallet hung up on the wall with a few nails, on which I hung pots and pans. This is a very simple kitchen, yet we managed to cook some pretty amazing meals there. On the more "technical side" of cooking, I have to precise that we used a double camping gas stove), that we just put on the countertop when needed. For dishes, we built up an outdoor dishes area, with a large bin filled up with water, connected to a tap above an old sink, collecting the grey water in a simple bucket. We wish we had time to work out a rainwater collecting system to be completely self sufficient, but unfortunately we couldn't make this happen. - Power. Luckily, we have an electrician in the house (not me...) who took care of the wiring of the house, installing light switches and plugs through the walls before the insulation was done, and it all connected to battery, charged by a solar panel that we moved around throughout the day to get the most energy possible. We deeply enjoyed living in this tiny house, even for just a few months. A lot of people asked us, why we were putting so much time and effort into this construction project, knowing that we would only live in it for a few months. But let me tell you, these 4 months of living in the Hummingbird House were the best! A peaceful, quiet, homey little nest, that we built with our little hands, surrounded by nature... that's all we needed. It was definitely worth the effort, energy and time we put in this project, and I am so proud of what we've done, each bringing our own skills and creativity, but also learning a lot along the way. Obviously, looking back there are many things we would have done differently. But hey, you learn from your mistakes, and we now know what to do or not do to in our next project (one day, somewhere, build a home of our own?). Hope you liked this little tour of our tiny house, and please comment below if you have any questions! And don't forget to share this post with your friends, who might be interested in tiny houses and upcycled projects! Je crois qu'il est plus que temps que je vous raconte cette histoire. Mais avant de vous faire visiter la maison Colibri, on remonte un peu le temps. Nous avons atterri sur le sol canadien à la fin du mois d'avril 2017, sans plan particulier en tête, mis à part de voyager et découvrir le pays. Après un peu (trop) de temps à Montréal, nous avons passé 4 mois sur les routes, au bord de notre van bleu, notre petite maison sur roues, parcourant l'Est du deuxième plus grand pays au monde. Quatre provinces (Québec, Nouveau Brunswick, Île du Prince Edouard et Nouvelle Écosse), et quelques milliers de kilomètres plus tard, nous avons décidé de nous poser quelques mois (malheureusement, voyager ça vide le porte-monnaie, et bien que j'adorerais pouvoir voyager à temps plein, nous avons fonctionné de cette façon là ces dernières années, à voyager quelques temps, puis se poser pour travailler et épargner avant de reprendre la route vers de nouveaux horizons). Nous travaillions à temps plein sur le site, et y étions également logés. Et quel beau lieu de vie : blottis entre l'Océan Atlantique et les Hautes Montagnes du Cap Breton, perdus au milieu de nulle-part, avec comme voisins des coyottes, aigles et orignaux. Puis, au milieu de cette belle forêt, D a vu cette petite cabane. Juste une petite cabane, faite de 4 panneaux en bois contreplaqué et un toit, une porte et une seule fenêtre. Rien de bien spécial, mais tellement de potentiel. Et l'emplacement, oh oui l'emplacement parfait. Isolé (mais quand même sur la propriété et à proximité des autres bâtiments. ), et entouré d'une épaisse forêt sauvage d'érables, épineux et bouleaux. Ça n'aura pas pris beaucoup de temps à D pour imaginer un plan d'attaque pour cette petite maison dans les bois, et à la fin de l'hiver, nous commencions à y travailler. Comme je l'ai dit plus haut, la structure de la maison (construite quelques années auparavant par un autre membre de l'équipe), est très basique : 4 murs en contreplaqué, et un toit, une porte et une fenêtre. Cette base nous a permis d'être très créatifs et de mener le projet dans n'importe quel direction choisie. Pour des raisons budgétaires et environnementales, notre idée et but de construction était de rénover cette cabane à partir de matériaux recyclés, autant que possible. Et je crois que nous nous sommes pas mal approchés du but, puisque le seul argent dépensé dans la construction de cette cabane a été l'achat du matériel électrique, pour le câblage et l'installation solaire. Le reste des matériaux ont été soit trouvés sur la propriété (matériaux restants de projets de construction passés sur le site, bois de récup', matériaux naturels, et matériaux divers glanés ça et là...), et notre matériau principal : des palettes. Nous avons dû faire plusieurs voyages en ville, faisant le tour des magasins et de leur arrières-cours, à la recherche de belles palettes pour l'intérieur de la maison. Travailler à partir de matériaux recyclés est intéressant, et a éveillé notre créativité. C'est un choix que nous avons fais délibérément : sensibles à la question environnementale, nous essayons au quotidien de réduire notre emprunte sur la planète. En voyant les montagnes de déchets produits chaque jour dans le monde, dont beaucoup de choses sont encore utilisables, on s'est dit que ce projet de construction se devait d'être au maximum en accord avec nos convictions. Pourquoi acheter de nouveaux matériaux quand quelque chose existe déjà quelque part? Un exemple parfait d'un des principes phares du mode de vie zéro déchet : le déchet de quelqu'un est le trésor de quelqu'un d'autre. Et c'est exactement ce qui nous est arrivé dans ce projet, en ouvrant bien les yeux, en analysant tous ces "vieux" matériaux et palettes usées, nos petits cerveaux se sont vites remplis d'idées pour donner à ces déchets une nouvelle vie, un nouveau dessein. Il y a un inconvénient à travailler avec des matériaux recyclés, en particulier les palettes : chaque morceau est différent, en taille, épaisseur, couleur, texture, robustesse... et donc chaque morceau doit être travaillé individuellement, ce qui rend la tâche bieeeen plus longue qu'en utilisant un bois neuf et uniforme. Mais bon, je crois que le temps était le prix à payer pour le rendu qu'on voulait obtenir. Pour les murs en palettes, nous avons collecté de nombreuses palettes, composées de bois différents, durs ou tendres, peintes ou vernies ou naturelles, et avons décidé de jouer de cette diversité dans notre design : l'intérieur de la cabane est couvert d'un "motif" de couleurs et textures. Nous avons laissé certaines palettes telles quelles, d'autres ont été simplement légèrement poncées, et d'autres ont été vernies ou peintes, avec des restes de peinture et lasure qu'on a pu trouver. Une fois les murs isolés, nous avons aligné des planches au sol, les arrangeant pour créer un "motif", avant de les couper à la bonne taille individuellement, puis de les clouer au mur. Meubler la mini-maison : garder les choses simples et pratiques. La maison Colibri est une très petite maison. Environ 9m². Nous avons vécu dans des espaces restreints auparavant (doux souvenirs de nos temps passés dans des campervans), et étions donc conscients de ce qui important dans le design intérieur et l'aménagement de ce petit espace. Simplicité : se contenter de l'essentiel au niveau mobilier, un lit, du rangement, une table et des chaises. Le minimalisme est pour nous la clé d'un quotidien agréable dans un petit (ou grand) espace. On se contente de ce dont on a vraiment besoin, et qui sera vraiment utilisé au quotidien. Le reste est juste considéré comme non essentiel. Pratique et simple d'utilisation : il n'y pas beaucoup d'espace pour bouger, le mobilier a donc dû être pensé de façon à ce que la transformation de "chambre" à "salon" se fasse en quelques secondes et facilement. Légèreté et espace : notre choix d'utiliser des matériaux recyclés, et plus particulièrement les palettes, apporte un côté vraiment unique, original à ce petit espace. Mais en même temps, ce matériau apporte aussi une certaine "lourdeur" visuel, il nous a donc paru important de garder un maximum d'espace libre, pour donner l'impression que la pièce n'est pas remplie de plein de choses inutiles. - Rangement. La majeur partie du rangement est situé au plafond, dans l'espace mezzanine sous le toit. Une grande étagère couvre chaque côté du plafon, avec un espace libre au centre pour un accès facile à nos affaires, tout en apportant aussi lumière et espace. C'est dans cet espace que nous avions rangé nos habits, chaussures, livres, affaires de toilette, etc. - Le canapé-lit. Nous avons fait beaucoup de recherches pour la construction de notre canapé lit et avons regardé de nombreux modèles sur internet, nous demandant quel serait le meilleur système pour cette mini-maison. Après beaucoup de réflexion, D a eu une super idée et nous a construit de beau grand lit deux places, qui se transforme en un canapé très confortable, avec la meilleure vue dans la maison, devant la grande fenêtre, surplombant la forêt. Il y a aussi une petite tablette à l'arrière, que l'on utilisait comme espace de travail additionnel quand on cuisinait, ou juste comme table pour manger. - La cuisine. Une fois encore, on a gardé les choses simples. Un beau plan de travail pour cuisiner, et des étagères en-dessous pour entreposer nos aliments. Deux grandes étagères au-dessus du plan de travail pour entreposer assiettes, bols et tasses, et une petite palette accrochée au mur, à laquelle j'ai ajouté quelques clous pour accrocher casseroles et poêles. Une cuisine minimaliste, mais dans laquelle nous avons cuisiné de délicieux repas. Pour le côté plus "pratique" des choses au niveau cuisine, je précise que nous avons utilisé un "set de camping double" marchant au gaz, que l'on mettait simplement sur le plan de travail quand on en avait besoin. Pour la vaisselle, nous avons construit un petit espace extérieur, avec un bidon placé e hauteur, rempli d'eau. connecté à un tuyau et un robinet, placé au-dessus d'un vieil évier. Les eaux grises étaient simplement collectées dans un seau placé en-dessous de l"évier. On aurait beaucoup aimé avoir le temps de travailler sur un système incluant la récupération d'eau de pluie, afin d'être complètement auto-suffisants en eau, mais nous n'avons malheureusement pas eu le temps de nous pencher sur cette partie du projet. - Énergie. Heureusement, il y a un électricien à la maison (et c'est pas moi...) qui s'est occupé de toute l'installation électrique de la maison Colibri, du câblage des murs, à l'installation d'interrupteurs pour les lumières, et des prises pour brancher nos appareils électriques. Le tout étant connecté à une batterie, chargée par un panneau solaire, que l'on prenait soin de bouger au courant de la journée pour charger la batterie au maximum. On a vraiment adoré vivre dans cette petite maison, mais si ce n'était que pour quelques mois. On nous a souvent demandé pourquoi on mettait autant de temps et d'énergie dans ce projet de construction, sachant dÈs le départ qu'on y vivrait que quelques mois. Et bien ces 4 mois de vie dans la maison Colibri ont été fantastiques! Un petit nid douillet paisible, calme et douillet, que l'on a construit de nos mains, en plein milieu de la nature... que demander de plus?! Le jeu en valait la chandelle, tout ce temps, énergie et effort ont été investis avec passion pour un projet dont on est fiers, et auquel nous avons tous deux apporté compétences et créativité, tout en apprenant de nouvelles choses. Bien sûr, avec le recul il y a beaucoup de choses qu'on aurait fait différemment. On apprend de ses erreurs, et on sait maintenant quoi faire, et quelles sont les erreurs à ne pas commettre, quand le prochain projet viendra (un jour, quelque part, construire notre propre petit nid?). J'espère que vous avez apprécié ce petit tour de notre mini-maison, et n'hésitez pas à commenter si vous avez des questions! Et n'oubliez pas de partager cet article avec vos amis, qui sont peut-être intéressés par les mini-maisons et les projets de recyclage de matériaux!